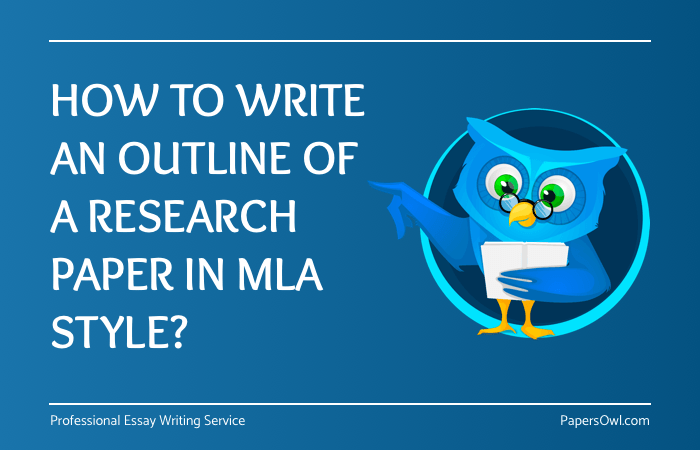 How to write an Outline of a Research paper in MLA Style? It is told that the mode of writing an outline for a research paper is a necessary thing to understand. However, the point is in comprehending the reason of why one should draw it up at all. Evidently, in some cases the outline could be a requirement for a paper, but what creates this aura of necessity for such a thing? The outline`s first assisting objective is to break down information into smaller logical pieces. Simplified navigation through text is great, but after navigation, comes the part that is more valuable: managing and applying this information. Regarding dissertations or any other papers with numerous amounts of pages, the presence of an outline or a simple plan is obvious. It must be quite hard to navigate through an enormous text without visual structure support it. Concerning less weighty papers, an outline helps to concentrate on the key aspects that are under survey. Having a writing plan in a small paper is not vital, because its main goal is simply to structure the text, and the Modern Language Association (MLA) writing standard doesn`t demand it in research papers. It still doesn`t mean that the intentional omission of a plan of the whole survey is a sensible decision. An outline helps to follow all formal aspects of the research study. In some cases where an outline is required, there should be a special way of formatting it. Here the most used technique is the MLA writing standard. It provides a coherent set of rules that guides you to compose the plan. Everything has its start, and for the outline, this start is a thesis statement. It usually includes two or three and in some cases a single sentence. It is not important how many words you use for the thesis in contrast to the sense of these words. The thesis statement aims to reflect the main idea of the research and to set a tone on what research is about. After the opening part of the plan – the thesis statement – the body of the work usually follows. In order to make it more convenient to write, the MLA writing standard proposes to divide subsequent thoughts into chapters. It is important to know, that all information divided into chapters should support the thesis statement. As every chapter needs a structural designation, MLA formatting advises the following. Headings of sections are numbered with roman numerals (I, II, III). If these sections are hereinafter subdivided, Capitalized letters are used (A, B, C). Finally for the last subdivision of a section come lower case letters (a, b, c). The page numeration of an MLA research paper uses small roman numerals (i, ii, iii). The MLA standard also recommends a writing plan in complete sentences. In cases where you are allowed to indicate corrections on printed research papers, use carets (ʸ) to show it. Correction is easy if you are submitting an electronic copy. Write complete sentences to support your thesis statement. All capital letters should be followed by phrases that offer proof, support evidence or explanation of the main idea. Now, take a look at a sample template of MLA research paper outline below. Thesis: Unless governments take serious measures toward curbing global warming, humans risk high temperatures, skin diseases, loss of plant and animal life. It is important that students take academic paper writing seriously, not to mention that with the right formatting style, you can never go wrong. Moreover, you can always buy MLA paper from Papers Owl or visit the site to learn more. The initial outline of the research paper consists of separate sections, which are united by a single logic of the study. It is also worth noting, the absence of a consecutive plan dooms all work to failure. A simple example of using a writing plan is to refer to previously aligned ideas of the author without losing sight of the main thought of research. While writing the research paper the author concentrates on his own ideas, but an outline gives a chance to think about the reader. Information included in a writing plan helps readers to orient themselves throughout the structure of the study. While not compulsory to use, an outline shows the effort spent on the studies' creation.